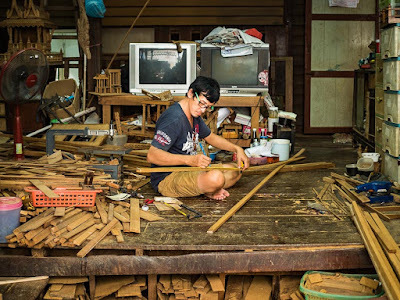 A man works in his home factory that makes Thai spirit houses out of teak wood. 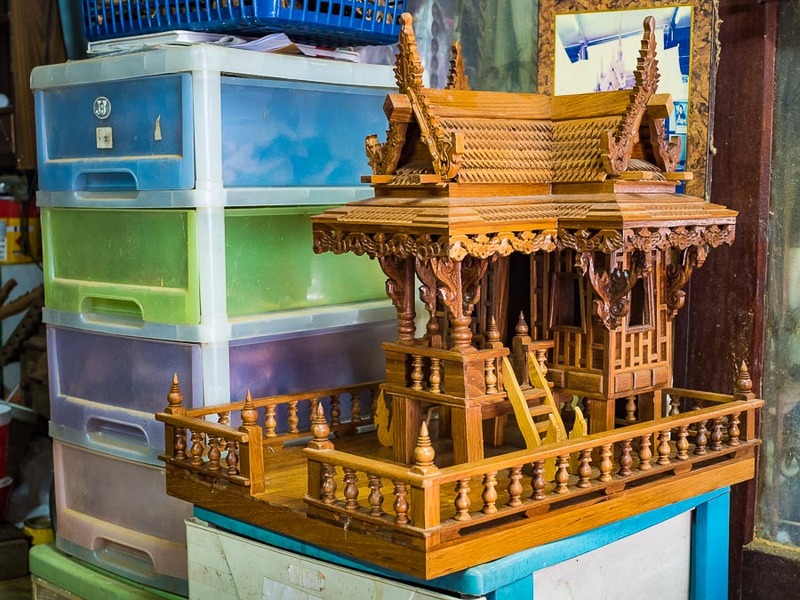 It's the last spirit house factory in Bangkok. Bangkok, like many old imperial cities, is a city of old artisans' villages. As Thailand has modernized, the artisans' villages have given way to condominiums and shopping malls. One of those villages in Ban Fuen, on the Thonburi side of the Chao Phraya River near Wat Suttharam. It's the community that used to make spirit houses. 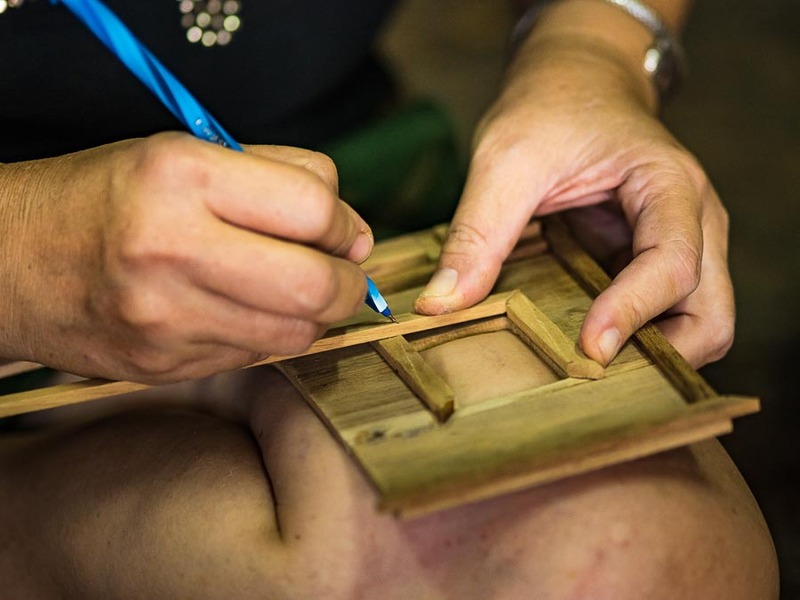 In the factory, which would be the car port in an American home, Gob, who runs the family spirit house business, works on the frame of a spirit house. Almost every home, almost every building, in Thailand has a spirit house. A spirit house is a shrine for the protective spirit of the property. In modest homes in the countryside or urban slums, the spirit house would reflect the owners' modest means. It might be a small spirit house in the corner of the home. In larger homes of the middle class, the spirit house would be on a pedestal in a corner of the property. For large homes of Thailand's elite, the spirit house would be a large, elaborate shrine. A midsized completed spirit house ready for shipment to a customer. It takes about three days to craft a house like this and it is completely hand made. 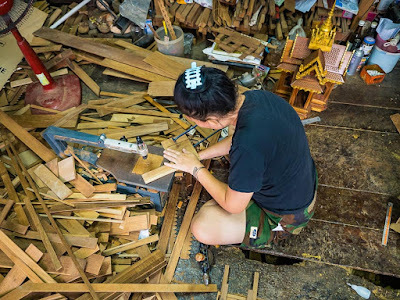 Spirit houses used to be made of teak and the ones in Ban Fuen still are. 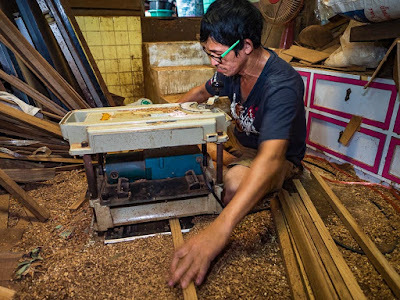 But just as monks' alms bowls are now mass produced, throwing traditional alms bowls makers out of work, spirit houses are now made of modern materials in large factories. What had been a community of ten or more families in Ban Fuen making spirit houses is now one family making them, mostly as souvenirs or show pieces. 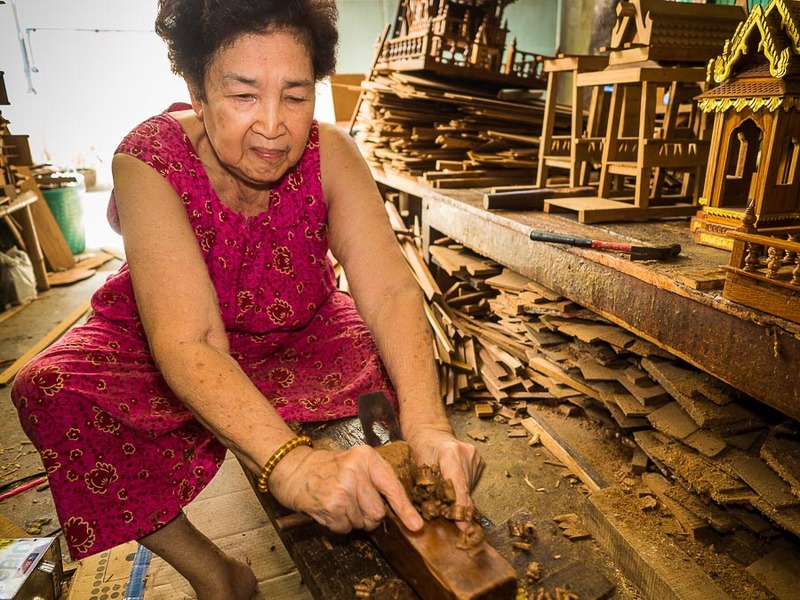 Hong, 77, is the matriarch of the family making spirit houses. 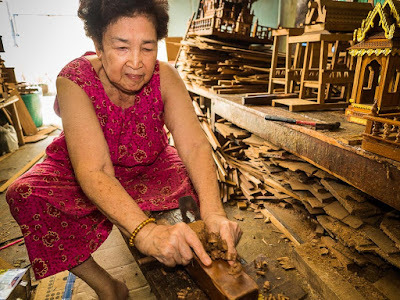 She still works almost every day helping her daughter, who now runs the family business. The family still lives in a traditional style Thai wooden home. It's on stilts, a little over a meter off the ground. Thousands of pieces of teak wood are piled underneath the home. Nothing goes to waste. 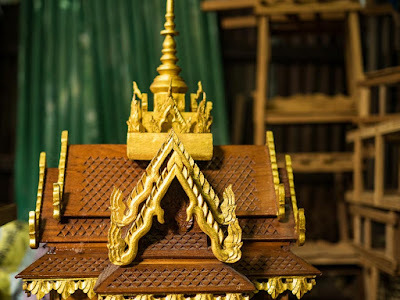 Large pieces of wood are cut into smaller and smaller pieces, some no bigger than a fingernail, and glued into place on the spirit houses. The home stands out from the neighbors because it is traditional. All around it are four and five story modern apartment buildings. High end condominiums are going up on the edges of the neighborhood, replacing the apartments that replaced the traditional homes. Working on an exterior wall of a spirit house. 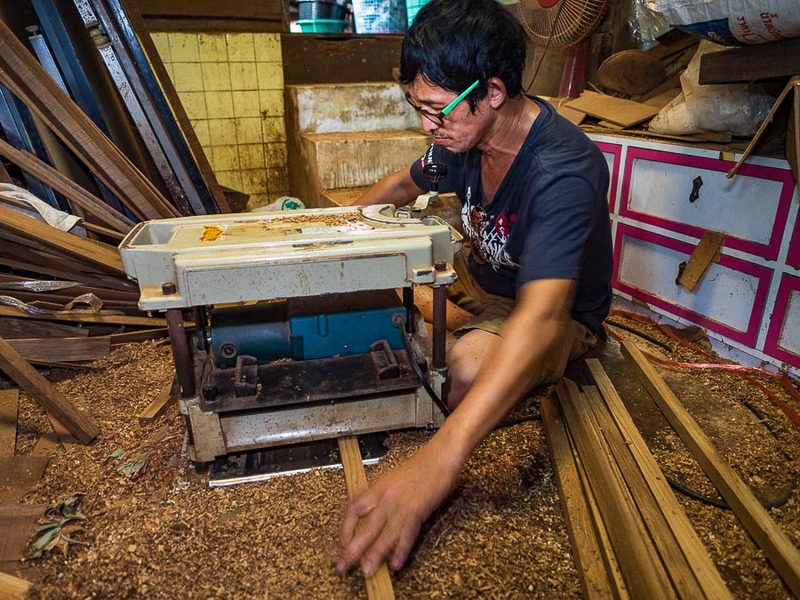 Just as none of the wood goes to waste, every part of the home is used in the workshop. The main fabrication is done in what would be the carport or garage of an American home. Dowels are sanded in a storage room off the dining area. The figurines that "live" in the spirit house are made in the living room. The storage room (what would be a pantry in the US) is used to finish smaller pieces of wood. Like the rest of the home, there's sawdust almost everywhere. In the living room, Gob works on the figurines that "live" in the house. It takes three days to several weeks to make a spirit house. The smaller ones (and most popular) take about three days. The largest takes about three weeks. Prices start at about 4,000THB (~$115 US). From there the sky is the limit. It's easy, based on size and ornateness, to spend well over $1,000 US. Although the smaller ones are mostly sold as souvenirs, the larger ones still serve an important spiritual function. The roofline of a midsized spirit house. The level of detail is astonishing. The frames of the smaller spirit houses are in the background. I don't know what the future is for the spirit house makers. Their neighborhood is changing. Hong, the matriarch, is 77. Gob, who runs the business, is 50. 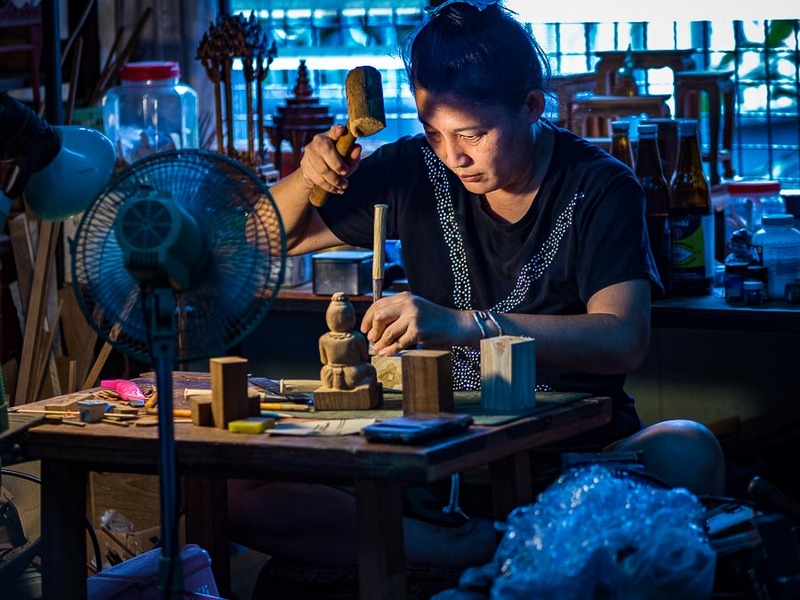 I can see a time when the spirit house makers, like so many of the other artisans' communities in Bangkok, are forced out to make way for "modern" Bangkok. There are more photos of the spirit house makers in my archive or available from ZUMA Press.